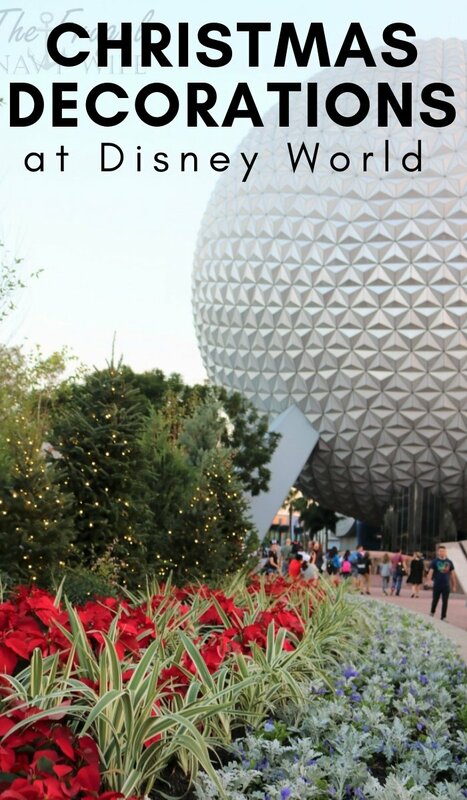 Visiting Disney World in Florida is a wonderful experience any time of the year, but there is truly something magical about going in the month of December when the Disney World Christmas Decorations are all up and you’re feeling in the holiday spirit. Disney knows how to make everything look amazing, and they don’t miss a detail. 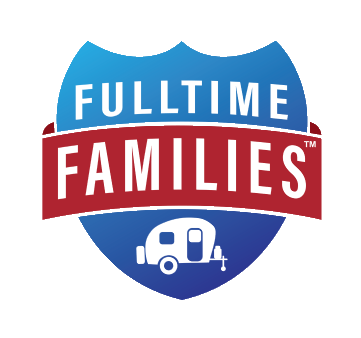 When planning your stay consider a Disney themed hotel like the Disney All-Star Movie Resort or something like the Gaylord Palms Hotel in Orlando Florida. 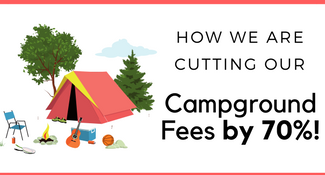 If you are looking more a more budget-friendly option then make sure to check out Airbnb and all the details for books a place from their site. As you pull up to each park, whether it is on the tram ride, or the monorail or ferry boat, you begin to see the decorations from afar and it is exciting, but once you really get up there and are standing by those huge trees and seeing all the wreaths and garlands, you feel a big part of the magic that I think Walt originally intended his guests to feel. 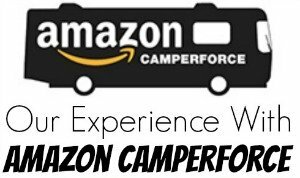 Here is a description of many of the things you can expect to see at each park, although there is plenty more still! Easily the park out of the four that is all decked from head to toe, so to speak. From all of the planters to the light posts, there is the feeling of Christmas everywhere. 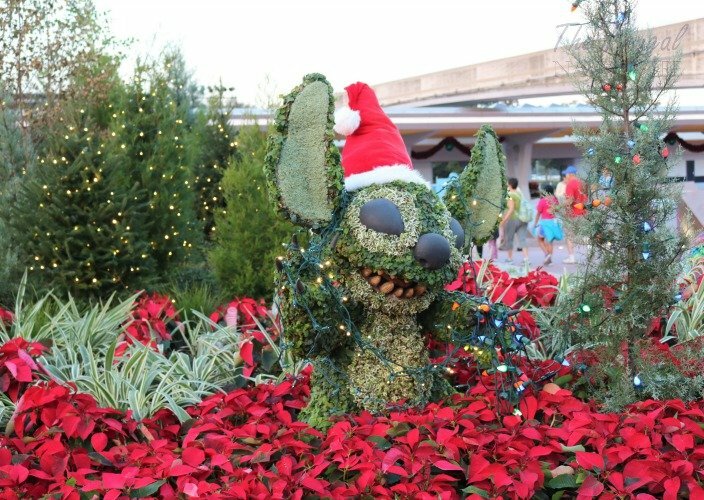 When you are approaching the entrance to the park there is a huge welcoming and colorful display of poinsettias and Christmas ornaments all over the place, and the park’s name and the main focal area is always done up amazingly on that lawn area as you walk in. 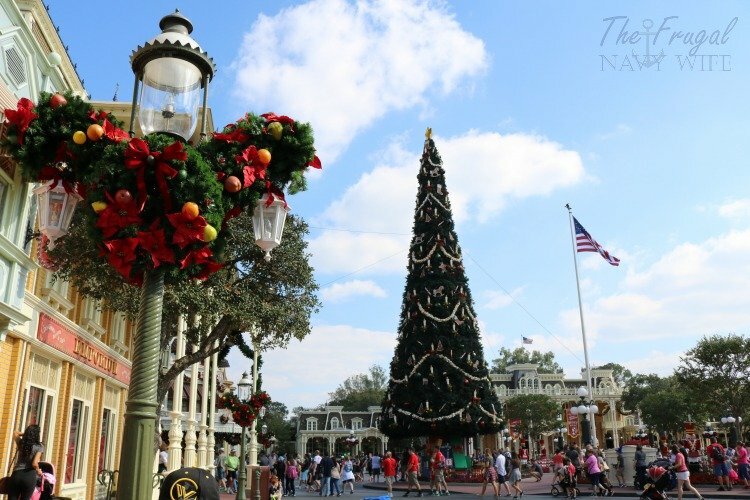 Then, coming into the park, in the center of the entrance to Main Street, is the huge Christmas Tree. It has giant sized ornaments so that you can see them from very far back. There are candles in the tree and the ornaments are in a theme of cookies and treats, along with an awesome garland of giant popcorn. Then, all along the central area, there are large toy soldiers as well. Great area to take photos in for sure! 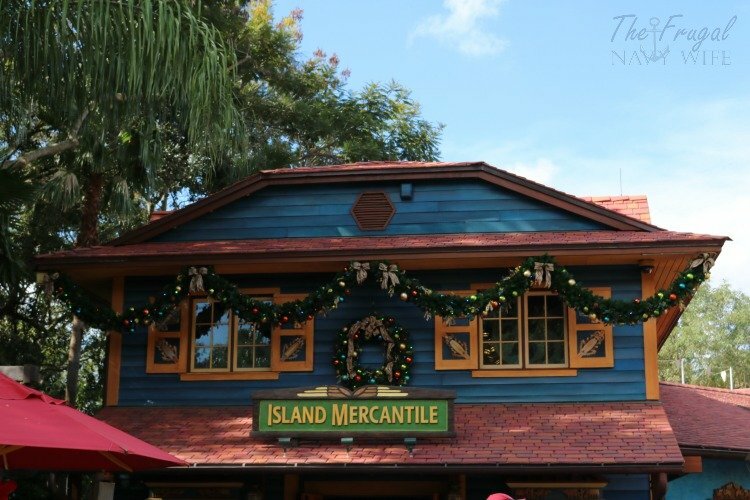 There is so much décor all over Main Street, but a few things to notice are the beautiful wreaths, such as the one on the door to guest services and other shops in the area. The light poles have beautiful trees one them and Mickey ear garlands as well. 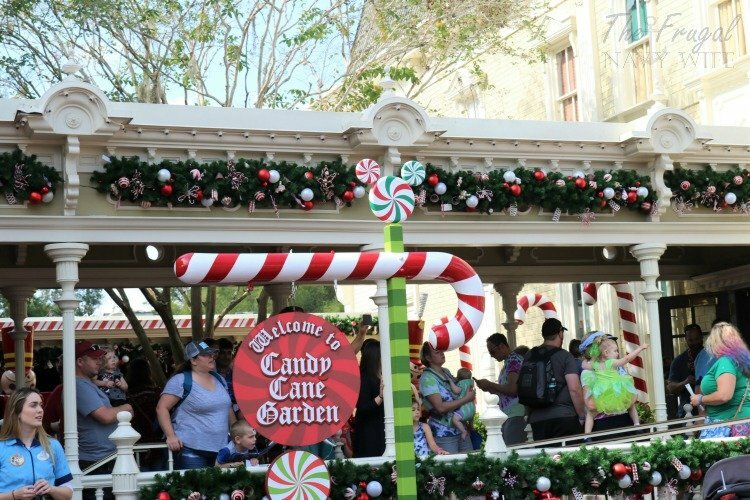 City Hall has garlands across the front, and right next door to that is Candy Cane garden, where you can take your little ones to meet Santa Claus. 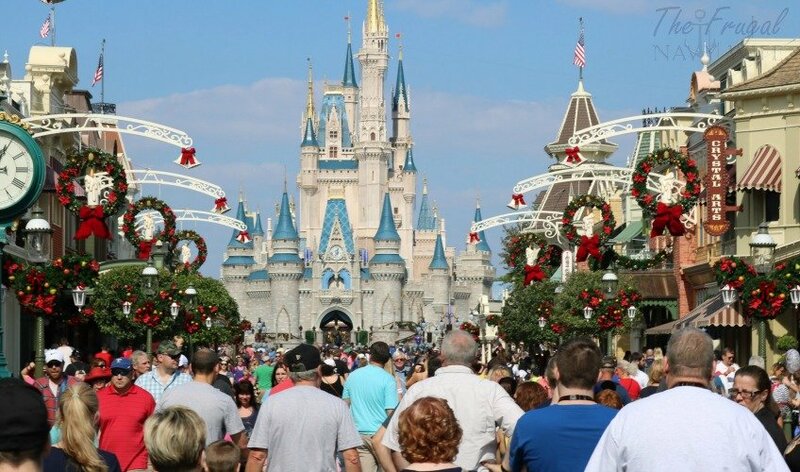 So, heading down Main Street into the other areas of the park, you will see Cinderella’s Castle in the center, and the entire street is pretty much screaming Christmas with all the wreaths and garland. If you walk all the way down to the castle, it is decorated as well. There are huge poinsettia trees to the sides of it, along with many beautiful plants, and all the lamp posts are done up. The castle, of course, changes colors at night and has lovely patterns of snowflakes on it at times throughout the evening. 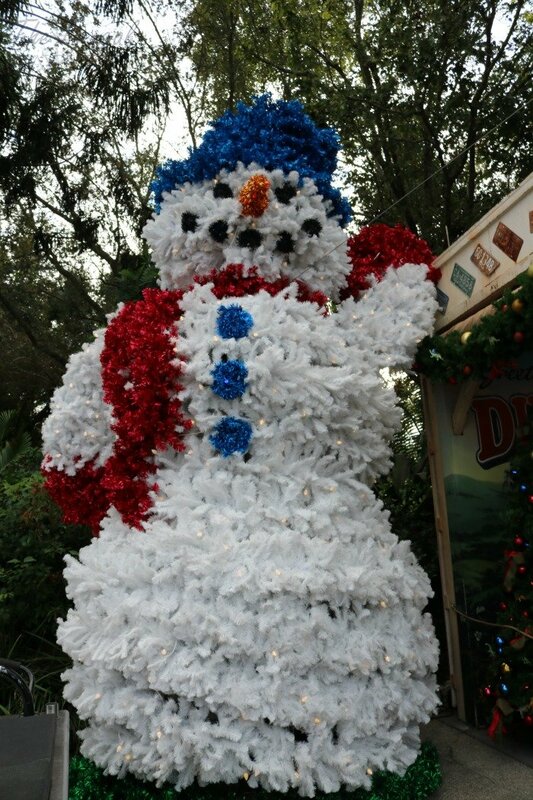 All over the park, you will see décor as well, but the heavy amounts of it are for sure in the main front areas. 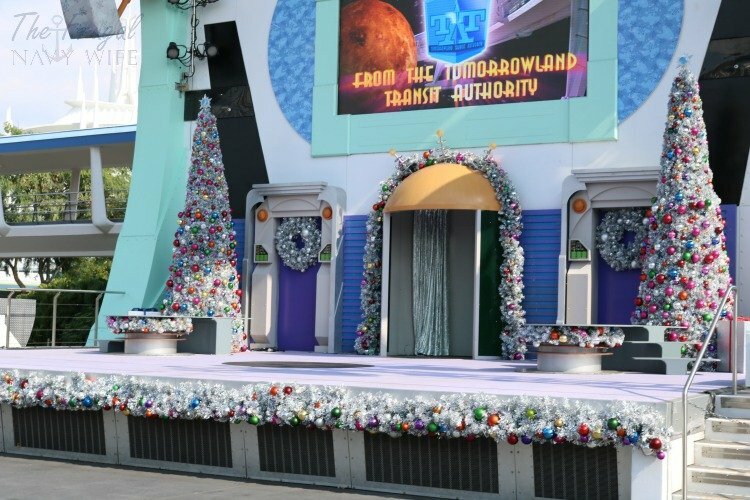 Tomorrowland has some really neat silvery type décor, to keep with the theme. 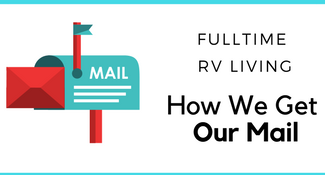 You can expect to see matching things in the themes of each area and the stores as well. There are always a few stores that carry specific Christmas décor, and one store will be open for that all year. If you love ornaments, you will not be disappointed, as there are so many to choose from, and they are different in many of the stores. 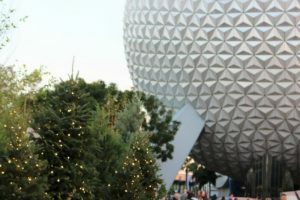 Visiting Epcot at Christmas is amazing, because they have the different countries with coordinating décor, and if you are there to see the Christmas décor, you will really enjoy seeing each one of them. Some have more than others and for sure do not miss the American one, or London. Both are so beautiful. 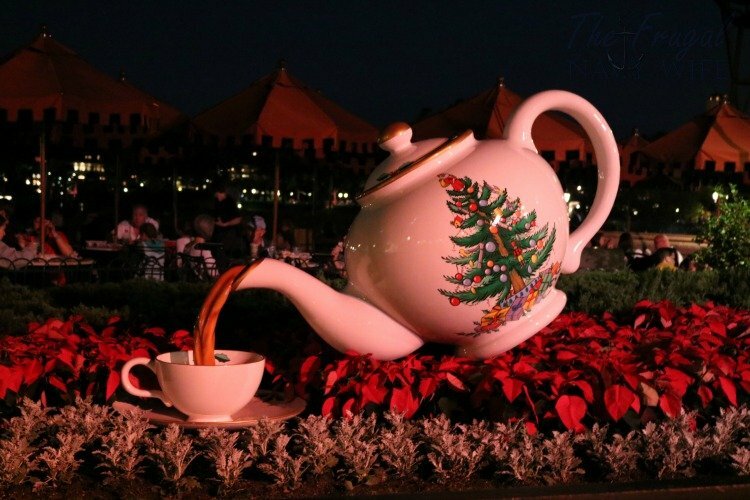 Epcot is known for the extraordinary topiaries they always have, and if you’ve ever been to the flower and garden festival, you’ll know just what I mean. But at Christmas, they do some awesome ones as well. 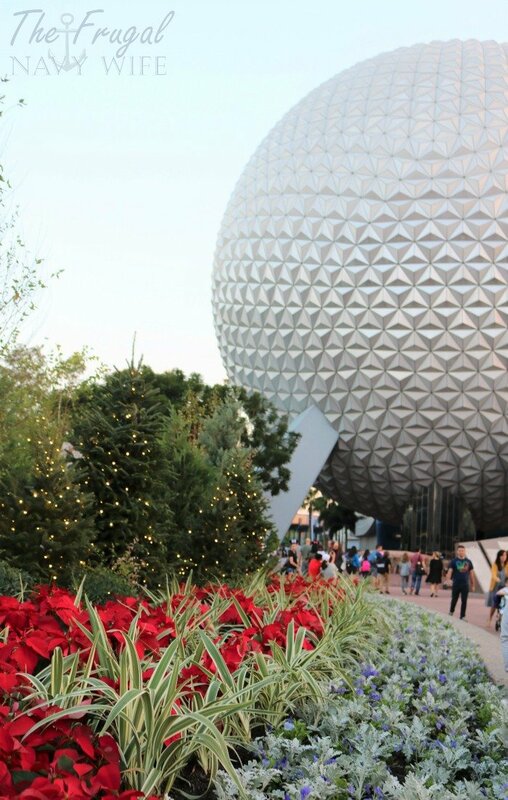 Right at the entrance, where you would be posing with the Epcot ball, is a double-sided planter that has characters made of a variety of plants in reds and greens, including Mickey and Minnie and also Stitch, who has gotten himself all tangled in the lights. All the planters have beautifully variegated grasses along with the poinsettias for a beautiful result. Then, as you walk through to the area where you can go out around the water and visit the countries, you will find another great picture-taking section with more of those, and a really neat snowman, as well as the huge Christmas tree. This tree has an angel at the top and some beautiful ornaments in whites and gold with gold garlands and gorgeous lights. 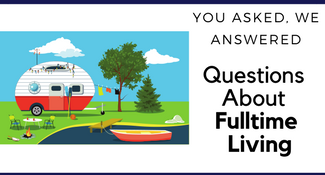 After that, take your time traveling to the countries and enjoying all the different decorations. As I mentioned before, London is wonderful as well as the huge tree in the American section. 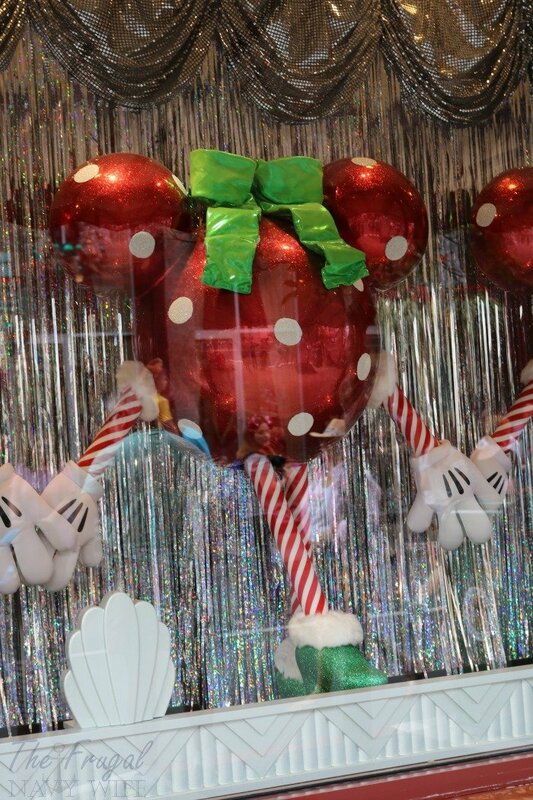 And don’t miss checking out the store windows, so many of them are done up for Christmas with the characters, Santa, and more. 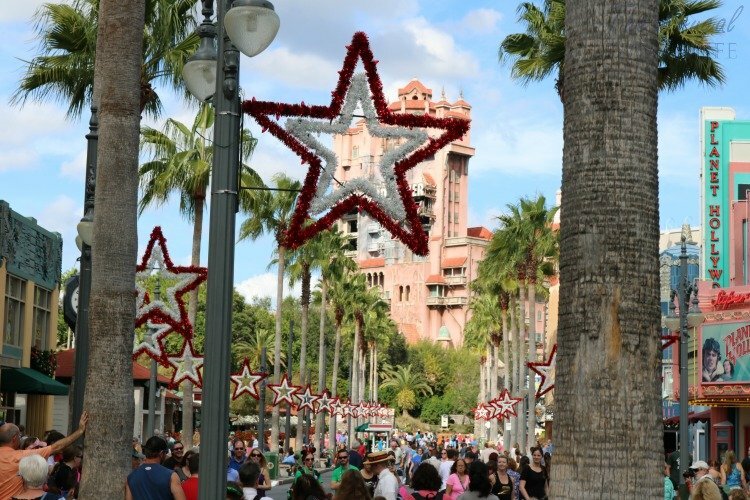 Hollywood Studios is the favorite if movies are your thing. 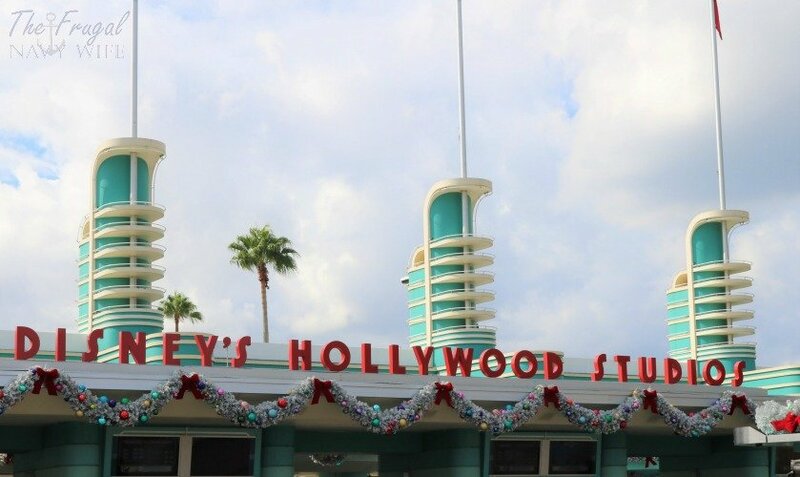 If you love anything that leans towards Old Hollywood style, you will love this park’s décor the best. 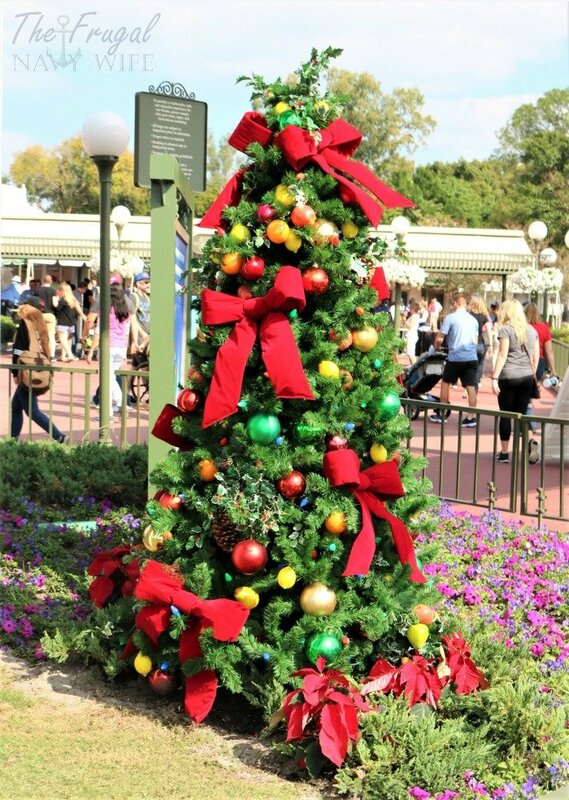 The Christmas tree is the first thing you will see when you are coming off the tram to enter the park. 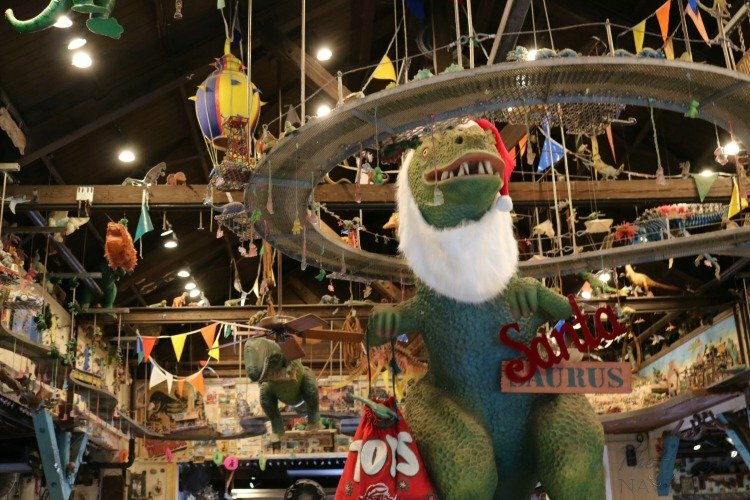 It has neat film strips around the bottom and some giant, but traditional style ornaments like colored balls and Santas, along with stars and classic garland. 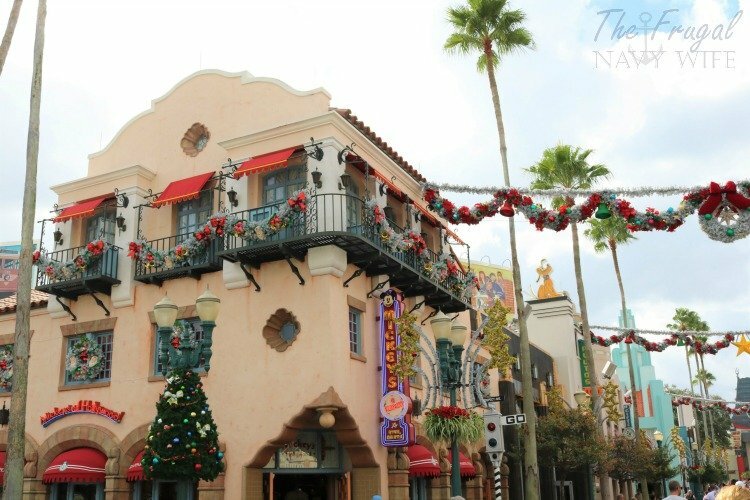 There are some really neat tinsel style garlands all over the place, in silver to keep with the “tinsel town” theme, and they have red accents everywhere to go with them. There are garlands and wreaths all down the main street, and the store windows and light posts are decorated as well. Some of the windows have animated features, like the Minnie Mouse window where there are multiples of her, kicking out her legs like the classic Rockettes would. Then, as you turn to the right, off that main street, towards the Tower of Terror ride, the entire street is lined with stars. Down this strip is also where there is a Santa Claus meet up if you want to get photos with him. This park has a brand new show this year at dark that is a Christmas themed show and it is different than any other one. It combines images and sounds with the fireworks and makes for a really cool experience so don’t miss it. This park does the whole safari theme in total Disney style, and if you’ve never been, it is so worth the visit. It is unlike the other parks in many ways, but still has all the bells and whistles of a Disney park and it does not disappoint. Their Christmas tree greets you as you get off the tram and it is huge, with a star at the top and covered in really awesome ornaments made of woods and glass, along with masks and very cool items. The bottom of it has many of the characters all the way around and each side is different so you will want to view the entire thing. Then as you enter the park there are garlands and wreaths, but it is not overdone in this park the way it is in the other ones. The way the park is laid out is very different, so you don’t have that entry with the long street they can decorate up. The shops and buildings have decorations on most, and at night they are lit up and beautiful. 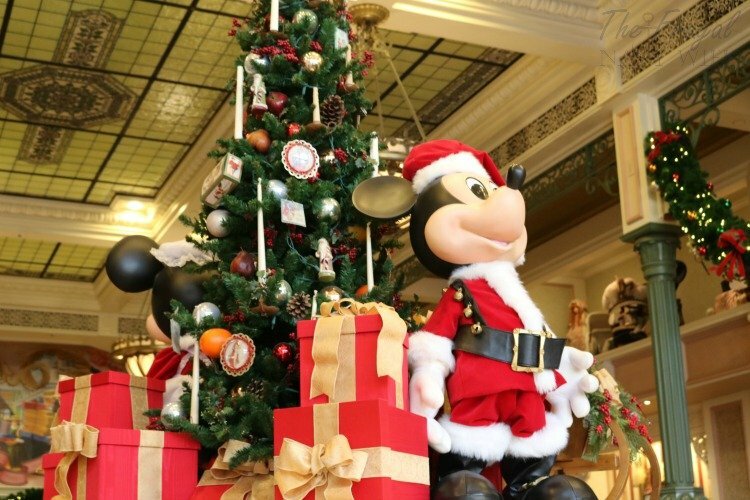 Inside many of the stores, there are great ornaments and other items you can find specifically for Christmas time, and they have turned some of the main stores into cute Christmas themes. They also have different sections in the shops with Christmas candies, and treats, as well as kitchen décor you can purchase, too. Overall, as you would expect, Disney does it right, and they do it in a way that no one else can compare with. « Astonishing Castles in Wales You Need to See!